Ajaz Patel was the only specialist spinner named in New Zealand's 13-man squad for their two Tests against Sri Lanka. Patel, 30, was given his chance against Pakistan in the United Arab Emirates and took 13 wickets at an average of 29.61 in three Tests. The left-armer will get another opportunity for the Black Caps, who face Sri Lanka in the series opener beginning at the Basin Reserve on Saturday. Will Young earned his maiden call-up as batting cover as New Zealand look to back up their series win over Pakistan. "There's a real swell of support for the Test team following their efforts in the UAE, so we're hoping to transition that momentum into a big home summer," selector Gavin Larsen said in a statement on Monday. 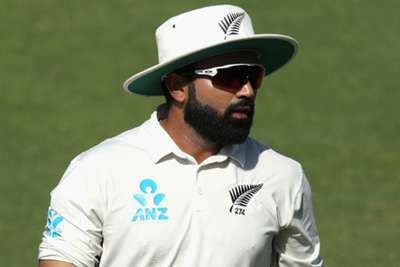 "Ajaz certainly grabbed his opportunity on the UAE tour and he's a proven performer in New Zealand conditions. "It's an exciting time for Will Young who has been pushing for higher honours for a while now. He scored hundreds against Pakistan A and India A in recent months and fully deserves his call-up. New Zealand: Kane Williamson (c), Trent Boult, Colin de Grandhomme, Matt Henry, Tom Latham, Henry Nicholls, Ajaz Patel, Jeet Raval, Tim Southee, Ross Taylor, Neil Wagner, BJ Watling, Will Young.